Sustainability requires radical innovations, but their introduction and diffusion usually encounter the opposition of existing socio-technical regimes. An important challenge is, therefore, to understand how to catalyse and support the process of transitioning towards these innovations. Building upon insights from transition studies (in particular the concepts of Strategic Niche Management and Transition Management), and through an action research project (aimed at designing, introducing and diffusing a sustainable mobility system in the suburban areas of Cape Town), the paper investigates the role of design in triggering and orienting societal transformations. A key role is given to the implementation of socio-technical experiments. A new socio-technical system design role emerges: a role in which the ideation and development of sustainable innovation concepts is coupled with the designing of appropriate transition paths to gradually incubate, introduce and diffuse these concepts. 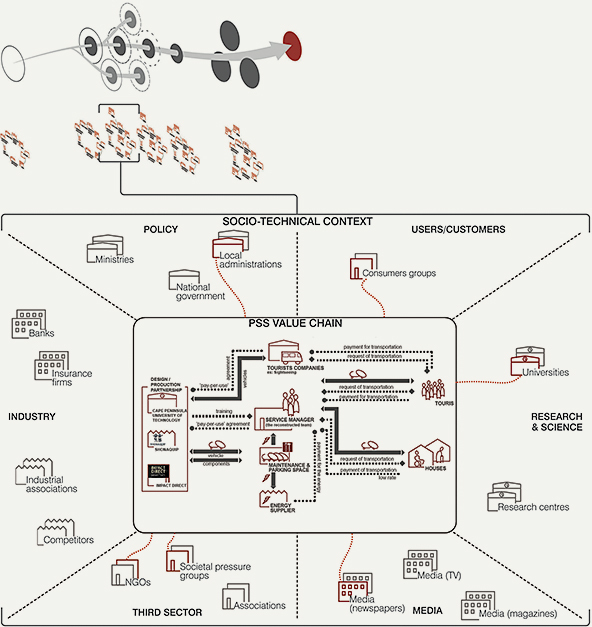 Keywords – Design for Sustainability, Product-Service System, Radical Innovations, Socio-technical Experiment, Strategic Niche Management, Transition Management. Relevance to Design Practice – This paper explores the idea of designing socio-technical experiments to trigger wider societal transformations and, by suggesting a bridge with the principle and practice of transition studies, provides some first insights on how designers can deal with the introduction and diffusion of radically new alternatives. Citation: Ceschin, F. (2014). How the design of socio-technical experiments can enable radical changes for sustainability. International Journal of Design, 8(3), 1-21. Received September 24, 2012; Accepted May 4, 2014; Published December 31, 2014. Copyright: © 2014 Ceschin. Copyright for this article is retained by the author, with first publication rights granted to the International Journal of Design. All journal content, except where otherwise noted, is licensed under a Creative Commons Attribution-NonCommercial-NoDerivs 2.5 License. By virtue of their appearance in this open-access journal, articles are free to use, with proper attribution, in educational and other non-commercial settings. Fabrizio Ceschin is a Lecturer in Design for Sustainability. He joined Brunel University in 2012 and was formerly at Politecnico di Milano (Italy). Fabrizio has expertise in Design for Sustainability, and in particular in the elaboration of strategies, methods, and tools to enable companies/public institutions/NGOs/communities to tackle sustainability challenges at different innovation levels: product, Product-Service System and social innovation levels. Within this framework he has been investigator in several international and national research projects, funded by the European Commission, Engineering and Physical Science Research Council (EPSRC UK), Italian national institutions, small and medium enterprises, and multinational enterprises. It is commonly accepted that the dominant socio-economic development models in industrialised contexts are unsustainable. The pressure of human beings on the environment has in fact profoundly modified natural systems, and today the planet is reaching its limits in the capacity of assimilating environmental effects caused by anthropic activities (Rockström et al., 2009). In the last five decades the reaction of humankind to sustainability problems has produced a series of approaches that has gone from end-of-pipe solutions to cleaner production and product eco-design strategies (Simons, Slob, Holswilder, & Tukker, 2001). However, although these kinds of interventions are fundamental and necessary, they are not sufficient to lead to the drastic reduction of resources consumption required to achieve sustainability conditions. Several studies in fact indicate that we can only consider sustainable those socio-technical systems whose use of environmental resources is at least 90% less than what is currently done in mature industrial contexts (Bolund, Johansson, & Steen, 1998; Factor 10 Club, 1994; Schmidt-Bleek, 1996). Although it is true that the adoption of these strategies can improve the environmental performance of products and production processes, it is also true that these improvements are often negatively counterbalanced by continuous population growth and increasing consumption levels (Binswanger, 2001; Brookes, 2000; Schmidt-Bleek, 1996). For these reasons, improvements to production processes and artefacts (products, services and infrastructure), must be coupled with new patterns of consumption (Manzini, 1999). This means that if we want to effectively tackle sustainability, there is a need to move from a focus on product and production processes improvements only, towards a wider approach focused on producing structural changes in the way production and consumption systems are organised. In other words we need radical innovations. Some concepts that theoretically and practically represent promising models to steer our production and consumption systems towards sustainability are the Product-Service System (PSS) and the social innovation ones. PSSs are specific types of value proposition that shift the business focus from selling products to offering a combination of products and services jointly capable to achieve a final user satisfaction (Goedkoop, van Halen, te Riele, & Rommes, 1999; Mont, 2002). In other words a PSS is oriented to satisfy users through delivering functions (e.g., mobility, having clean clothes, thermal comfort, etc.) rather than selling products (e.g., cars, washing machines and powder, boilers and methane, etc.). If properly conceived, this kind of innovation can offer an economic and competitive incentive for stakeholders involved to continuously seek improvements in resource management (Heiskanen & Jalas, 2000; Stahel, 2000; UNEP, 2002; White, Stoughton, & Feng, 1999). It is a model that changes the reward system because producers and providers are paid per unit of performance delivered and not per unit of product sold. Such an approach can potentially delink resources consumption from its traditional connection with profit. Social innovation is a process of change whereby new solutions emerge from the inventiveness and creativity of variety of actors directly involved in solving daily life problems: ordinary people, communities, grass roots technicians and entrepreneurs, local institutions and civic society organizations. Some of the solutions emerged (examples are: self-managed services for the care of children and the elderly; new forms of exchange and mutual help; alternative mobility systems; socialising initiatives to bring cities to life; networks linking consumers directly with producers, etc.) present interesting potentialities in generating and diffusing new and more sustainable ways of living (Jégou & Manzini, 2008; Meroni, 2007). In other words they represent potential ways of living well while at the same time consuming fewer resources and generating new patterns of social cohabitation (Manzini, 2008). However, despite their sustainability potential and the knowledge and know-how so far accumulated, it must be underlined that the application and diffusion of these kinds of innovations is still very limited. The basic reason is that sustainable PSSs and sustainable social innovations may require a profound redefinition of the production and consumption modalities and, therefore, they may cope with the current and dominant socio-technical systems (and their established and relatively stable set of rules and networks of actors) (Ceschin, 2013; Tukker & Tischner, 2006). In other words they can be usually considered radical innovations, and as such they may involve fundamental changes in culture (the sum of norms and values that together constitute the perspective from which actors think and act), practice (the sum of routines and behaviours), institutional structures (rules, regulations, power structures), and economic structures (market, financing, consumption, production) (Rotmans & Loorbach, 2010). In other words, these innovations require breaking down the routine behaviour that is daily reproduced by individuals, groups, business communities, policy actors and society at large. For this reason the introduction and scaling-up of such innovations are not completely under the control of a single actor (or a small network of actors), because changes in the factors that form the boundary conditions (i.e., existing organisations, institutions, networks, dominant practices, interests etc. ), are as well required. The challenge is not only to conceive sustainable PSSs and sustainable social innovations (several approaches and tools can in fact be used to support this task), but also to identify which strategies and pathways are the most appropriate to favour and hasten their introduction and scaling-up. Recent advancements in the transition studies field (in particular the contributions from Strategic Niche Management (SNM) and Transition Management (TM) approaches) have provided insights into how to understand, influence and orient the adoption of system innovations. According to these theories, the introduction of radical innovations requires the creation of partially protected socio-technical experiments (Brown, Vergragt, Green, & Berchicci, 2003; Hoogma, Kemp, Schot, & Truffer, 2002; Raven, van den Bosch, & Waterings, 2010; Rip & Kemp, 1998; Van den Bosch, 2010; Van der Laak, Raven, & Verbong, 2007). Protection allows incubation and maturation of radical socio-technical configurations by partly shielding them from the mainstream market selection environment. A pathway of socio-technical experiments can be used as a strategic arena for learning, shaping future expectations and establishing new social networks in order to gain momentum for diffusion and challenge and change socio-technical regimes (Raven, 2005). This paper proposes the adoption and adaptation of concepts and insights from transition studies into design. 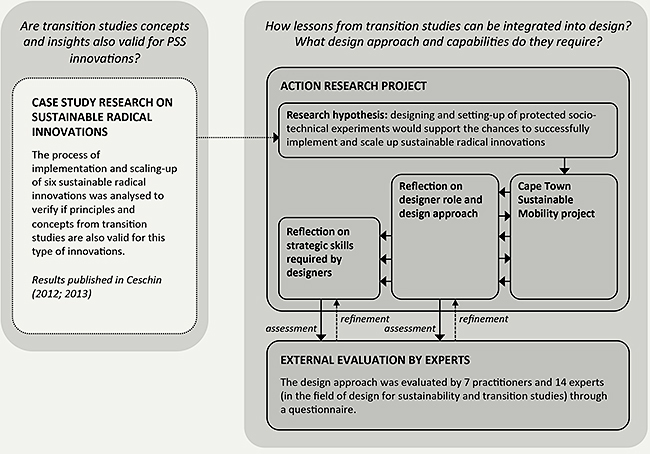 In particular the paper explores the potential contribution that a socio-technical system design approach can make in stimulating, supporting and hastening the process of transitioning to sustainable radical innovations. In making this argument particular emphasis is placed on the design approaches and capabilities required by designers. The article begins by illustrating how concepts and theories from transition studies (in particular the concept of socio-technical experiment) could provide a framework to understand and orient radical innovations. Then the paper discusses how design is addressing the issue of radical sustainable changes, underlining limitations and knowledge gaps in current approaches. After illustrating the research question and methodology the paper continues by presenting an action research project, called Cape Town sustainable mobility, aimed at designing and implementing a radical innovation: a sustainable mobility PSS for the disabled and elderly people in the suburban areas of Cape Town. 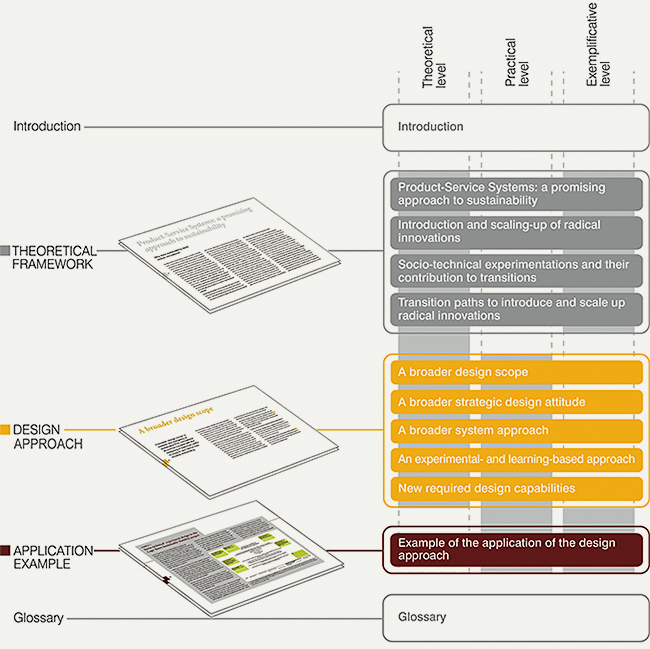 Building upon the project experience, the fifth section discusses the potential role of design in triggering wider societal transformations by designing transition path (i.e., sequences of small scale socio-technical experiments); in this respect the paper provides a first framework of action by suggesting the adoption of key approaches and principles. The article then outlines the new capabilities and skills required by designers to operate at such level. The paper concludes by identifying some key areas for future research. Transition theorists refer to system or radical innovations as major changes in the ways societal functions such as transportation, communication, housing and feeding are fulfilled (Rip & Kemp, 1998; Geels, 2002). Through historical socio-technical case studies, transition scholars have analysed how system innovations take place and have elaborated a model, called the multi-level perspective on transitions (Geels, 2002, 2005), that describes the dynamics regulating these complex and long-term processes. Geels adds that these dynamics depend on the interactions between three different functional levels: the socio-technical regime (meso level) which refers to the dominant and relatively stable set of culture, practices and institutions related to a specific field (e.g., mobility or energy); the niche (micro level), a protected space “isolated” from the influence of the dominant regime, where radical innovations can be tested, become more mature, and potentially challenge and change regime practices and institutions; and the landscape (macro level), which represents the social, economic and political context in which actors interact and regimes and niches evolve. Niches are, therefore, a crucial step towards a regime shift because they can shield radical innovations from market competition and allow continuous experimentation to lead innovations to mature (Schot & Hoogma, 1996). In other words niches can act as “incubation rooms” for radical novelties (Geels, 2002), where socio-technical experimentation and learning processes take place. Thus, it clearly emerges that an important pre-requisite to the introduction of radical innovations is the creation of partially protected environments where to conduct socio-technical experiments. Firstly, experiments are conducted with radical innovations: innovations that require substantial changes on various dimensions (socio-cultural, technological, regulative and institutional). Secondly, experiments are not simple tests undertaken inside a company’s laboratory but are implemented in real life settings. The idea is that only this kind of experience, outside the R&D settings, can truly lead to testing and improving radical innovations. Moreover these experiments take place at a small scale but strive to trigger changes at a wider scale. Thirdly, these experiments do not include only the actors more strictly linked to the innovation (such as producers, partners and suppliers). Instead, a broad variety of actors is involved, including also users, policy-makers, local administrations, NGOs, consumer groups, industrial associations, research centres, etc. In other words the aim is to recreate a whole socio-technical environment in a small scale. In this sense these experiments are characterised by a broad participatory approach (i.e., a variety of actors is involved in discussing, negotiating, co-creating and developing the innovation). Fourthly, the experiment is implemented in a space protected from the mainstream selection environment. The idea is to temporarily shield the innovation from the selection pressure (which consists of markets and institutional factors), creating an alternative selection environment. There are different forms of protection: financial protection (such as strategic investments by companies, tax exemptions, and investment grants) and socio-institutional protection (such as the adoption of specific regulations). The crucial dilemma of protection measures is to find the right balance between the need to nurture the innovation and the need to prepare it for the selection pressures of a market environment (Weber, Hoogma, Lane, & Schot, 1999). The aim of these experiments is to learn about and improve the innovation on multiple dimensions, not only the technical, economic, market demand and usability aspects, but also the political, regulative, environmental, cultural and social dimensions. In this sense the innovation is maintained open to continuous adjustments and refinements. In general experiments can also serve to identify the various resistances and barriers (institutional, regulative, economic, etc.) that can potentially hinder the future implementation and diffusion and understand how to address them. Moreover, and this is a crucial aspect, socio-technical experiments are not only aimed at testing and improving the innovation, but also at stimulating changes in the socio-technical context, in order to create the most favourable conditions for the innovation. In other words experiments are also strategically used to influence contextual conditions in order to favour and hasten the societal embedding process (for example, by influencing local administrations to adopt policy measures that support the innovation, or stimulating potential users to change their behaviours and routines). Labs, to test, learn about and improve the innovation on multiple dimensions (technical, usability, regulative, political, economic, and socio-cultural). This entails a “deepening” process (Van den Bosch, 2010), which means learning as much as possible about an innovation within a specific context, enabling actors to learn about local shifts in culture (ways of thinking, values, reference frameworks, etc. ), practices (habits, ways of doing things, etc.) and institutions (norms, rules, etc.). The result is a continuous development and reinforcement of the new set of culture, practices and institutions related to the new innovation. Windows, to raise interest in the innovation project and the related actors, disseminate results, build up synergies with existing similar projects/initiatives, and attract and enrol new actors (e.g., new users or potential partners). In other words experiments can be used as communication and conversation tools to stimulate and facilitate interaction with new social actors. Agents of Change, to influence contextual conditions in order to promote and quicken the transitioning process. Experiments should be conceived to create and diffuse new ideas and knowledge, and stimulate various social groups (users, public institutions, companies, etc.) to change their perspectives, beliefs, and behaviour. Learning processes are seen as drivers for radical changes, and socio-technical experiments should represent a stimulus to induce these processes, and lead actors to reframe their behaviours and attitudes (for example, they can stimulate users to rethink and change their behaviours and routines). While the process of implementing small-scale socio-technical experiments is crucial for incubating radical innovations, it must be stressed that single experiments do not result in regime changes. Sequences of articulated local experiments can gradually add up to wider changes (Raven, 2005; Geels & Raven, 2006): new practices, culture and institutions, that are initially local, broad and unstable, can become more articulated, specific and stable, and potentially capable of producing effects on a macro scale. This is the process that Van den Bosch (2010) calls ”broadening”, which means replicating the experiment in different contexts and linking it to other projects and initiatives. Since learning within an experiment is limited, experiments should be repeated in other contexts, in order to learn about different designs in different settings. Broadening is related to the idea that different experiments carried out simultaneously can build on each other and gradually reinforce themselves (Geels & Raven 2006; Raven 2005). If we look to the evolution of Design for Sustainability (DfS) in the last 2 decades, it is clear that this discipline has enlarged its field of action. In fact the focus has moved from single products to services and Product-Service Systems and, more recently, to social innovation and large-scale socio-technical changes. contributing to create relations between the stakeholders of a value constellation (Zurlo, 1999), and acting as facilitator to stimulate a strategic dialogue and co-design processes with them (Meroni, 2008a). A further shift took place when the design for sustainability community started to investigate existing examples of bottom-up social innovations (Meroni, 2007), and explore the potential role of design in this respect (Jégou & Manzini, 2008). The emphasis has been on investigating the role of designer in triggering, supporting and orienting these community-based innovations through: the adoption of user-centred approaches to better understand problems and opportunities (Jégou & Manzini, 2008; Mulgan, 2009); facilitating participatory processes using visualisation techniques and co-design tools (Jégou & Manzini, 2008; Mulgan, 2009); empowering individuals and communities enabling them to start and mange new bottom-up initiatives (Jégou & Manzini, 2008). This is in line with the transformation design approach (Burns, Cottam, Vanstone, & Winhall, 2006; Sangiorgi, 2010), whose main aim is to “leave behind the tools, skills and organisational capacity [to enable local actors] to continually responding, adapting and innovating” (Burns et al., 2006). The Design for Sustainability research community made another step forward when it recognised the necessity of moving towards the identification of strategies and approaches to implement, replicate and scale-up sustainable innovations. In other words the challenge is not only to propose scenarios and concepts of sustainable changes but also to contribute to realise such socio-technical changes (Vezzoli, Ceschin, & Kemp, 2008). Thus, researchers have started to explore the potential contribution of design in large-scale changes. The MEDEA institute at Malmö University proposed to use Living Labs to experiment, explore and support the scaling-up of grassroots social innovations. The concept of Living Lab refers in general to experimentation environments in which innovations are created in real life contexts by fostering collaboration between researchers, companies, end users and other relevant stakeholders (Ballon, Pierson, & Delaere, 2005; Stålbröst, 2008). The activities of Malmö Living Labs focus on supporting local actors in developing bottom-up social innovations by prototyping solutions (Hillgren, Seravalli, & Emilson, 2011). They propose an open-ended approach, where prototyping is used to test and refine solutions, but also to create “agonistic spaces”, where a variety of stakeholders are involved in discussing and addressing dilemmas (Hillgren, Seravalli, & Emilson, 2011). In line with Malmö Living Labs, the Design Department of Politecnico di Milano proposed the concept of “Enabling Experiment”,2 to refer to the implementation of favourable environments to enable local actors to take active role as co-creators in the development and proliferation of social innovations. An important contribution is that they acknowledged that large-scale changes require the implementation of a multiplicity of diverse and interacting experiments (Manzini & Rizzo, 2011). In this respect Meroni (2008b) and Jégou (2011) speak about “synergizing” or “acupunctural planning”, a set of synergic self-standing local experiments that, adopting as a metaphor the practice of the traditional Chinese medicine, aim to generate changes in large and complex systems operating on some of their sensible nodes (this is consistent with the broadening process mentioned in the previous section). 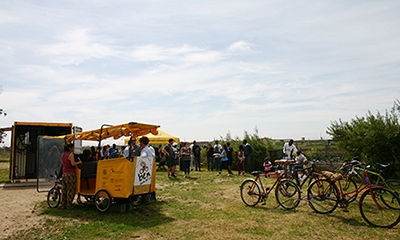 Examples of this kind of interconnected and synergetic experiments can be found in the Feeding Milano project, aimed at prototyping and implementing a network of “0 miles” food related services between the city of Milan and the peri-urban area known as Agricultural Park South Milan (Cantú, 2012; Simeone & Cantú, 2011). The concepts of Malmö Living Labs and Enabling Experiments are consistent with the research results achieved by transition studies scholars. However, it must be stressed that in these two approaches the characteristics of socio-technical experiments are not investigated and analysed in depth. Several issues are not addressed and remain unclear. In particular: How to set up and protect spaces to shield the innovation in the first stages of the experimentation activities? The questions that are addressed are: What are the key dynamics in socio-technical experiments and what are the key factors influencing success and failure? What are the mechanisms through which a sequence of experience can lead to large-scale changes? What role can be played by different actors (users, policy-makers, local administrations, NGOs, consumer groups, industrial associations, research centres, etc.) in this process? As shown in the previous section, transition studies have explored the above issues deeply and can, therefore, provide useful insights in order to better define and clarify the design approach to be adopted to conceive, implement, and manage socio-technical experiments. This is not to diminish the important contribution that the previously mentioned researchers at Malmö University and Politecnico di Milano have made on analysing co-design approaches in the context of socio-technical experimentation (an aspect which is currently not investigated deeply by transition studies scholar). From what it has been written above, it appears that creating a bridge between the disciplines of design for sustainability and transition studies would be promising. The hypothesis is that the adoption and adaptation of principles and concepts from transition studies can enrich and advance the current debate on the role of design in large-scale sustainable changes. If transition studies can provide insights on how large-scale sustainable changes can be initiated and supported, the questions at this point are: How can lessons from transition studies be integrated into design? What role can designers play in initiating, supporting and orienting sustainable changes at the socio-technical system level? What design approach and capabilities do designers require? The case study research on past sustainable innovations is not described in this paper but in Ceschin (2012, 2013). The process of implementation and scaling-up of six sustainable PSSs was analysed (in particular the analysis was on: the role of socio-technical experiments; the socio-economic actors involved during the process; negotiation processes and alignment of actors’ expectations; learning processes). The aim was to verify if principles and concepts from transition studies are also valid for this type of innovations. 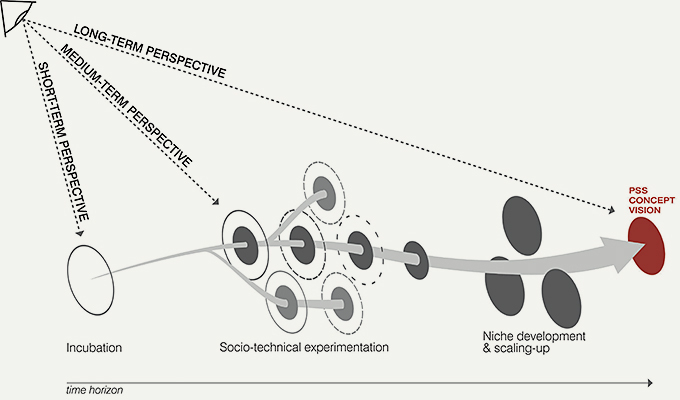 In particular the case study research showed that the setting-up of sequences of socio-technical experiments (capable to act as Labs, Windows and Agents of change) represents a crucial step to support and hasten the incubation, testing and maturation of radical sustainable innovations, and potentially their scaling up. (II) Action Research Project Aimed at Designing, Introducing and Diffusing a Sustainable Mobility System in the Suburban Areas of Cape Town. Building upon the results of the previous stage, the aim of the action research project was to investigate the design role in supporting and facilitating the process of implementation and diffusion of a sustainable innovation. The hypothesis, derived from the first stage of the research, was that the implementation of socio-technical experiments would have supported the scaling-up of the innovation. An action research project, aimed at designing and introducing a sustainable mobility system in the suburban areas of Cape Town, was used to reflect on the design approach. This was an iterative process in which researchers were continuously involved in applying the design approach and reflecting on how to improve it. In fact action research seeks to “bring together action and reflection, theory and practice, in participation with others, in the pursuit of practical solutions to issues of pressing concern to people” (Reason & Bradbury, 2001, p. 1), in an iterative cycle of planning, acting, observing and reflecting (Kemmis & McTaggart, 1988). The author was part of a research team directly involved in the project management, participating in the design activities as well as interacting with the other actors and practitioners involved in the project. In executing the project, the strategies used for the data collection were: observing participants involved in the project, and using a logbook to keep notes (of activities undertaken, actors involved and their roles, motivations, dilemmas) and reflections. (III) External Assessment Made by Experts and Practitioners in the Field of Design for Sustainability and Transition Studies. The reflections made during the action research project identified a new role for design for sustainability and to propose a new design approach (and a set of related required skills). This design approach was evaluated by 7 practitioners and 14 experts (in the field of design for sustainability and transition studies) using a questionnaire. This kind of assessment is important because the process of introduction and diffusion of sustainable radical innovations could require several years, and, consequently, cannot be easily studied in a real time perspective. Accordingly, in order to complement the experience done in the action research project, it was decided to also evaluate the approach in terms of its potential practicality (how much the approach is usable in the settings for which they have been designed and developed) and effectiveness (how much the use of the approach might led to desired outcomes). Theoretical background. It provides a theoretical background on the basic concepts related to sustainable radical innovations and socio-technical transitions. Design approach. It illustrates the design attitude and skills required by designers to support and orient the societal embedding of sustainable radical innovations. Application example. It describes the application of the design approach in the Cape Town Sustainable Mobility project. Figures 2. The structure of the document provided to evaluators. questionnaires avoid the risk that the interviewee could be subjected to pressure from the interviewer. Table 1. Questionnaire: questions, answers and changes following the evaluators’ suggestions. The various aspects of the document were rated using a scale from 1 to 5 (1 = Very Poor; 2 = Poor; 3 = Sufficient; 4 = Good; 5 = Very Good). provide reflective space to the interviewees. A purposeful sampling technique was used to intentionally sample a group of people that could best inform the research problem under examination (“information-rich” participants who had direct experience relevant to the phenomenon of interest: experts and practitioners in the field of design for sustainability and transition studies). Regarding the sample size, the principle of theoretical saturation (Morse, 1995; Strauss & Corbin, 1998) was adopted. The principle refers to the continuation of sampling and data collection until no new conceptual insight is generated. A sample size of 14 academic experts and practitioners was initially used. Later an additional 7 participants were involved. Based on the information provided by the second group of participants and the scarcity of new information that emerged from the last 3 questionnaires (comments and suggestions for improvement were similar to the one provided by the other participants), sampling was completed with 21 participants. Although it is not possible to define the number of participants in advance, literature says that a range of 20 to 30 interviews may usually achieve theoretical saturation (Patton, 2002). The overall evaluation of the design approach was positive. 6 out of 7 practitioners affirmed that they could use the approach (partly or entirely) as guidelines for on-the-job application. Regarding academic experts, 13 out of 14 stated that the approach and the action research project are useful as reference material (in particular as a teaching resource), and 9 out of 14 affirmed that they could use it as guidelines for on-the-job application (in particular in applied research projects). Participants were asked to evaluate the design approach and provide insights on how to refine it. Table 1 reports the answers provided by participants. In summary, the process to answer the research questions was not linear but rather iterative and interactive. Iterative, because the design approach was implemented in a practical design experience and continuously developed, adjusted and refined during the whole design process. Interactive, because the process was characterised by a continuous collaboration among researchers, practitioners and experts: that continuously brought input on how to improve the design approach. In the next sections the order of the activities undertaken is not presented in a completely chronological way. Rather, for the sake of clarity, the choice is to firstly present the action research project and then the reflection on the design role and approach. 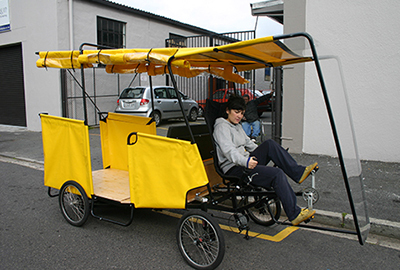 The Cape Town Sustainable Mobility project involves, as main actors, Shonaquip (a small South African company producing wheelchairs and mobility equipment for disabled people), Bicycle Empowerment Network (BEN Bikes, a local association aimed at promoting sustainable mobility projects and initiatives), the Cape Peninsula University of Technology (CPUT), and Politecnico di Milano (Polimi). The aim is to introduce and diffuse a sustainable mobility Product-Service System (PSS) for the disabled and elderly people in the suburban areas of Cape Town. In particular the system is expected to offer disabled and elderly people increased mobility services from their homes to the nearest public transport stops, or to local schools, hospitals, etc. Technically, the mobility system is designed around a solar, electric and human powered light vehicle (prototyped by IPSIA “A. Ferrari” Maranello high school and Politecnico di Milano university in 2006). This mobility system is conceived especially to create benefits in suburbs such as those in Cape Town, which are often characterized by substantial mobility problems due to a lack of high quality public transport services. The initial PSS concept was developed by Hazal Gumus (2009) for her master’s degree thesis, conducted in collaboration between Polimi and CPUT. The thesis project raised the interest of Shonaquip and in July 2009, a process to socially embed the PSS innovation officially started. The initial assumption, which drove the implementation strategy, was that the setting-up of protected socio-technical experiments would be promising in realising socio-technical changes. The characteristics of these experiments are described in section 2. The activities undertaken in the project can be grouped in three main phases: incubation, aimed at setting up the conditions needed to start the societal embedding process; socio-technical experimentation, aimed at implementing the first socio-technical experiments, to learn and explore how to improve the PSS innovation and how to favour and support its societal embedding; and scaling-up, aimed at removing protection and transforming the experiments in a fully operative service. At the time of the writing of this paper the project consortium is in the between of the second and the third phases. The next step was the development of a draft transition path to identify the main steps between the present situation and a future situation with the PSS implemented. Actors involved in these first two steps were the research team (made up of academics and research students from Polimi and CPUT) and Shonaquip. The following step was the identification of actors to be involved in strategic discussions. It was decided to firstly include a restricted group of actors (the ones considered crucial to start discussing and strengthening the PSS concept and the transition path) and later extend participation to a wider variety of actors such as the Cape Town municipality, the local public transport company, and local media. Actors initially involved were potential users, local citizens, technology experts from CPUT, and two local NGOs: Disability Workshop Enterprise Development, DWDE (active in providing job opportunities to disabled people) and the Reconstructed Team (an association aimed at reintegrating into society former drug addicts and criminals). Adjust the PSS concept. It was decided to also offer a transportation service for tourists within the city centre (in order to increase the sources of revenue). In relation to the vehicle the design requirements were specified. Adjust the transition path. In particular it was agreed that the next step would have been the implementation of a small-scale experiment in the Athlone district (focused only on the transportation of elderly people), to be later extended to other suburban areas of Cape Town. Identify implementation barriers. The main problem that emerged was the unavailability of financial resources to entirely finance the vehicles’ production and the pilot implementation. Moreover another concern was related to the local availability of solar panels and lithium batteries. Finally it emerged that local regulations did not allow the use of human-powered vehicles for public mobility services. Identify new actors to be involved. It was recommended to establish connections with Cape Town municipality (and in particular the transport department) to solve the previously mentioned regulative issues and develop synergies with the public transport service. Moreover it was suggested to identify and involve an actor that could manage the tourist transportation service in the city centre. Agree on the tasks to be assigned to each actor. In particular it was agreed that Shonaquip would have managed the production of the vehicles (in collaboration with DWDE) and manage the service (in collaboration with the Reconstructed Team). CPUT would redesign the vehicle and contact the actors to be involved. Polimi would collaborate in the vehicle redesign and in seeking financial resources for the pilot project. In summary, the result of this phase was the building up of a first network of actors and the development of a shared project vision and a first hypothesis of transition strategy. The involvement in this first phase of a broad variety of actors was crucial in order to allow the project consortium to focus on different dimensions of the problem (technical, economic, sustainability, usability, etc.). On the other hand, it emerged the difficulty to coordinate and manage discussions among a variety of actors, and the need of a network manager capable to act to manage controversies and conflicts within the network and establish bridges between different actors’ expectations. In the second phase two socio-technical experiments were designed and implemented. The first experiment was implemented in the Athlone district (Bridgetown), in collaboration with the Reconstructed Team, and was aimed only at testing and improving the technical and usability aspects of the PSS innovation. 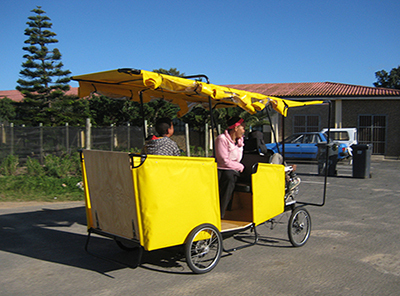 In the first stage, before concluding the vehicle construction, an existing rickshaw was used to test the service of transporting the elderly in the neighbourhood, involving them in identifying critical issues and suggesting potential improvements (Figures 3 and 4). In the second stage, once the vehicle prototype was completed, a series of technical tests took place (Figure 5). After having settled the vehicle’s technical problems and collected the first feedback on the service, the project consortium was ready to start the experimentation with users and the new vehicle. At this stage the Reconstructed Team decided to leave the consortium. This was an unexpected decision, particularly given the positive response by users during the service test. They explained that the decision was due to other activities in which they were engaged which meant that there were no personnel available to manage the complexity of this experimentation. On the other hand they confirmed their interest to implement in future, after the experimentation phase, a full operational service with a fleet of vehicle. The main lesson learned from this defection was that the importance of the presence of an internal catalyst, capable of promoting and supporting the project from inside each involved institution. Project promoters should have established stronger connections with key people in the Reconstructed Team in order to guarantee a more stable commitment. Figures 3, 4. First socio-technical experiment. These photos were taken by the author during the service test (July 2011). Figure 5. First socio-technical experiment. It's taken by the author during technical test of the vehicle (August 2011). At this stage the project consortium needed to find another actor willing to continue the experimentation and manage the implementation of a fully operative service. A contact was established with BEN Bikes (Bicycle Empowerment Network). BEN Bikes is a local association aimed at promoting sustainable mobility projects and initiatives and providing job opportunities for low-income people. For this purpose they have several centres located in the suburban areas of Cape Town. The defection of the Reconstructed Team and the involvement of BEN Bikes led to the adjustment of the project vision. In particular BEN Bikes proposed to use their suburban hubs as operative centres to manage local mobility services and vehicle maintenance. For this reason the second socio-technical experiment was undertaken in collaboration with one of these hubs, and in particular the one placed in Lavender Hill suburban area. This second experiment was implemented in October 2011 and is still running. It was designed and organized in order to act as a Lab, Window and Agent of Change. Test and improve the vehicle: the role of BEN Bikes is to check the vehicle on a daily basis, in order to report the technical problems and identify potential solutions (in collaboration with Shonaquip, CPUT and Polimi). Test and improve the service: the quality of the service is assessed using questionnaires and semi-structured interviews. Test users are asked to evaluate the service, identify critical aspects, but also to propose potential alternatives and improvements. Test and improve the PSS configuration: verify the PSS configuration in terms of stakeholder value chain and business model and identify potential improvements to be implemented. Meetings involving project promoters are scheduled on a monthly basis to discuss these issues. Identify barriers: the pilot is also used to identify potential implementation and diffusion barriers on multiple dimensions (e.g., socio-cultural and regulative). For this reason various actors (such as the local community, local institutions and NGOs) are involved to express their opinions, remarks and suggestions (regarding this see also experiment as a Window and Agent of Change). Of course most of the barriers were identified in the previous steps (during the incubation and the first experiment). However project promoters considered crucial to use the experiment to identify any further potential barriers. Figure 6. Second socio-technical experiment: testing the PSS (October 2011 by the author). It must be stressed that the approach adopted is aimed at favouring broad participation in the design choices. All the involved actors (from the potential users to the local community and the local institutions) are asked not only to evaluate and provide feedback on the project, but also to propose adjustments and alternatives. The experiment was also designed to raise interest in the innovation project and attract and enrol new potential users and other relevant actors (experiment as Window). It represented a working prototype of how things could work, a conversation tool aimed at enhancing participation and enabling discussions with a larger audience of relevant socio-economic actors. With respect to this the BEN Bikes centre was conceived as a sort of ‘open gallery’ to allow visitors to see, touch and acquire information about the project (Figure 7). Interested people can freely visit the centre and better understand the features of the project and its environmental, socio-ethical and economic benefits. Moreover demonstration visits are organized with specific actors (for example potential users but also potential future partners, local institutions, etc.). BEN Bikes personnel have been trained to be able to effectively describe the project and in particular to illustrate the potential advantages for different kinds of actors. This was considered particularly important by project promoters because there was the need not only to disseminate information about the project but also to stimulate changes in actors’ behaviour and routines (for example stimulate potential users to reflect on their mobility habits and consider the benefits that the solution could provide to them). This is strictly connected to the third function of the experiment: experiment as Agent of Change. Figure 7. Second socio-technical experiment: interested people visiting the Lavender Hill BEN Bikes centre (October 2011, by the author). The experiment was also conceived to stimulate changes in actors’ behaviour and habits and create favourable conditions for the introduction and diffusion of the PSS (experiment as Agent of Change). Consequently, in October 2011 an event for relevant actors was organized. The aim of this event was to officially launch the experiment, illustrate the potential future developments, and discuss with invited actors how to support and create the conditions to accelerate the project. The event took place at the Lavender Hill BEN Bikes centre. a workshop with participants to discuss the potential synergies that could be built to sustain and expedite the project. The results of the event were positive. Firstly, local actors evaluated the project as valuable for local communities, because of its potential to bring about tangible economic, environmental and socio-ethical benefits. Secondly, one of the actors involved, the local clinic, stated their interest in implementing a service for the transportation of patients as soon as possible. Thirdly, the Transport department of Cape Town confirmed its interest in strengthening synergies between the PSS and the suburban bus lines. In addition the Transport department stated they would have planned meetings in their agenda to discuss the policy measures needed to support and foster the particular vehicle typology adopted in the PSS. Starting from an initial PSS concept proposed by a small network of actors, the first project resulted in the building up of a broad network of actors and the alignment of their expectations towards the achievement of a shared vision. Currently, the main actors committed to the project are a company (Shonaquip), a NGO (BEN Bikes), a local institution (the Cape Town municipality), and two universities (Polimi and CPUT). the second, at Lavender Hill, is much more articulated and is still running. It is currently aimed at: testing and improving the whole PSS, raising interest in the project and enrolling new relevant actors, stimulating actors (such as potential users) to change their behaviour, routines and mental frameworks, and stimulating changes in the socio-technical context (such as changes in the regulative framework). the Cape Town municipality is interested in creating synergies with the PSS and the public transport services (in particular in relation to the suburban bus lines). If we analyse the Cape Town Sustainable Mobility project from a design perspective we can see that design activities focused not only on conceiving and developing the PSS innovation but also on understanding which strategies and development pathways are the most appropriate to support the implementation of the new socio-technical system. A new design attitude is necessary to operate at such socio-technical system level and, as a consequence, designers require new capabilities. the identification and involvement of the actors that can support the societal embedding process in the various steps of the transition path. Figure 8. A broader design scope. Design has a role not only in ideating and developing sustainable innovation concepts (I), but also in triggering and orienting transitioning processes: the designing of the sequence of phases and steps (II), and identification of the actors to be involved along the whole process (III). In these transition paths a key role is played by socio-technical experiments. In other words design focussed, not only on generating a vision of how a mobility need could be met in an alternative and more sustainable way, but also on how to achieve that vision. In this transition path a crucial role is played by socio-technical experiments. As described in section 3, some researchers (e.g., see Hillgren et al., 2011; Jegou, 2011; Manzini & Rizzo, 2011; Meroni, 2008b), have recently started to explore the use of experiments to favour large scale changes. These differ to the research reported in this paper where experiments are not only used to test, improve and enhance radical innovations, but also to change the context in which the innovation should be introduced. In other words, following transition studies insights, experiments are conceived not only as labs and windows, but also as agents of change (i.e., to create the socio-cultural, institutional and organizational changes required to support the implementation and subsequent scaling up of the innovation). the short- and medium-term actions to be undertaken in order to orient the innovation journey towards the achievement of the project vision: the incubation of the innovation and the implementation of two socio-technical experiments. Figure 9. The multi-term design attitude. The focus is simultaneously on different time perspectives. The project vision and the strategy to achieve the vision are not designed separately. Traditionally, the design of a solution is seen as a separate activity from the realisation of that solution. Here, there is not this dichotomy: the design of the project vision is done simultaneously with the design of the transition path. In the notion of PSS design for sustainability Manzini and Vezzoli speak about the need of adopting a ‘strategic attitude’, referring to a design capable to address sustainability operating on the integrated system of products, services, communication and stakeholders value chain through which a company (or an institution, NGOs etc.) presents itself (Manzini & Vezzoli, 2003). However, designing socio-technical experiments to influence changes at the socio-technical system level requires the adoption of an even broader strategic attitude (Figure 10). In fact the project actors should focus not only on the solution (the PSS innovation) but also on the technical, socio-cultural, institutional and organisational contextual conditions that might favour or hinder the societal embedding process. In other words this strategic attitude refers to two main aspects. Firstly, understanding the conditions that, at the socio-technical context level, might favour the innovation. Secondly, identifying the strategies to be adopted to make those conditions happen. Figure 10. A strategic attitude should be adopted in the designing and management of societal embedding processes. 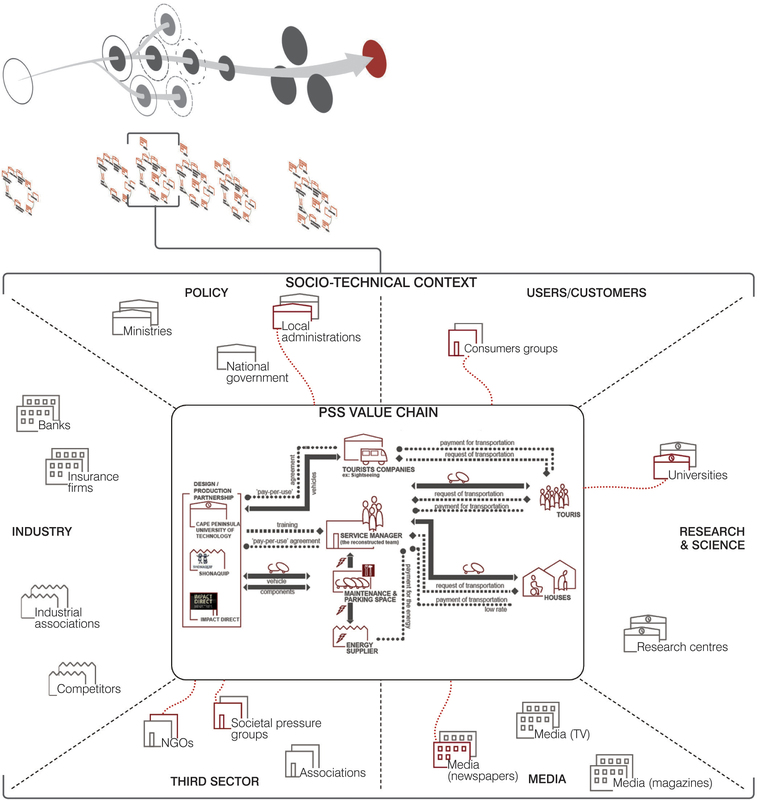 In this sense the transition path (and in particular the sequence of socio-technical experiments) is aimed at influencing changes in the socio-technical context in order to create favourable conditions for the introduction and scaling up of the innovation (red arrows). In the Cape Town Sustainable Mobility the project consortium adopted a strategic behaviour because it tried to influence the socio-technical context, in order to create the most favourable conditions for the innovation. This was achieved by involving those actors that, directly or indirectly, could have affected regime practices and institutions and by stimulating changes in their behaviours, attitudes and practices. For example, one of the identified contextual barriers for the introduction of the PSS was related to the local road regulation. In order to solve this problem, PSS promoters involved in the project the municipality of Cape Town to stimulate the Transport Department to modify such regulation. Moreover the involvement of the Transport Department was also important to start developing proposals for the integration of the PSS concept with the local suburban public transport system. Again, compared to existing approaches, the main contribution is that it is made explicit that experiments (and all the related activities, events, etc.) need to be deliberately designed in order to trigger changes in the socio-technical context in which they are inserted. And this through a strategic approach aimed at involving crucial socio-economic actors. Researchers working on design and radical sustainable changes (see section 3) have always emphasised the importance of involving a broad range of actors in co-design processes. Meroni (2008b) speaks about “community-centred approach”, where the design focus is oriented towards the engagement of a community to activate local changes. Manzini and Rizzo (2011) and Hillgren et al. (2011) stress the importance of involving all the actors in co-designing within a process of continuous and open-ended experimentation. However, the composition of the actors to be involved is not made explicit. Transition studies suggests that establishing and developing a broad and heterogeneous socio-economic network is crucial to protect, support and foster radical innovations (Raven, 2005). In particular it is crucial to involve outsiders and insiders actors (with respect to the dominant socio-technical regime): outsiders (e.g., outsider firms, scientists, societal pressure groups) are needed in a network because they do not share the current regime institutions and practices and therefore they may contribute in the development of innovations that deviate from that regime (Van de Poel, 2000); insiders (e.g., policy makers, governmental institutions) should be involved because they can support and protect the innovation in the start-up phase (in order to give experiments legitimacy and stability) and in the subsequent phases (in order to create widespread support for scaling up the new practices and institutions related to those experiments) (Weber et al., 1999). In other words, it is required the involvement of a broader network of actors (Figure 11). This is what the project actors tried to do during the Cape Town Sustainable Mobility design experience. In fact, they focussed not only on involving the actors that could have played a role in the value chain (Shonaquip, BEN Bikes, suppliers, users, etc. ), but also on other relevant actors belonging to the socio-technical context in which the PSS was being introduced (NGOs such as DWDE, the Cape Town municipality, local media, etc.). In other words they focussed on creating a broad network characterised by scientific, social, economic, politic and cultural linkages. Thus, when designing transition paths (and sequences of socio-technical experiments), it is crucial to involve those actors that can start a bottom-up process of change, but also those actors that can create favourable conditions to protect and support the innovation through top-down processes. Finally, it is possible to say that the approach adopted in the project was characterised by a dynamic design and management attitude (Figure 12). The project vision was not a static outcome to be achieved; it was continuously adjusted as a result of changes in internal and contextual conditions and as a result of what was learnt by actors during the societal embedding process (in particular during socio-technical experiments). For example, the defection of the Reconstructed Team led to the involvement of BEN Bikes in the project network, which in turn led to adjusting the project vision (i.e., introducing the idea of developing mobility service based on BEN Bikes hubs and in synergy with the local public transport company). Adjustments in the project vision led of course to modifications in the transition strategy. Even the network of actors involved in the societal embedding process was dynamic: the composition, as well as the required tasks for each actor, continuously evolved in time as the different phases in the transition path required different network compositions. For example, the Cape Town municipality was involved only in the second phase of the societal embedding process, when institutional protection for the experiment was required. Figure 12. A dynamic design and management attitude should be adopted. The project vision is not a static outcome to be achieved, and the transition strategy is not a fixed roadmap to be covered. Changes in internal and contextual factors, unpredictable events, learning process by project actors during the societal embedding process can lead to adjusting the project vision and, as a consequence, to re-orient the transition strategy. In this project it was crucial to adopt a flexible and dynamic approach in order to manage these continuous re-directions and adjustments. An open-ended approach is required because of irreducible uncertainty, unpredictable events, changes in contextual conditions, and conflicting and alterable actors’ expectations and views. This is in line with the idea of using experiments as “vehicles able to raise questions as well highlight controversies and dilemmas” (Hillgren et al. 2011), allowing conflicting voices to coexist. Translating the project vision into a transition strategy. Designers should learn to translate a vision into the steps needed to support its implementation and scaling-up. 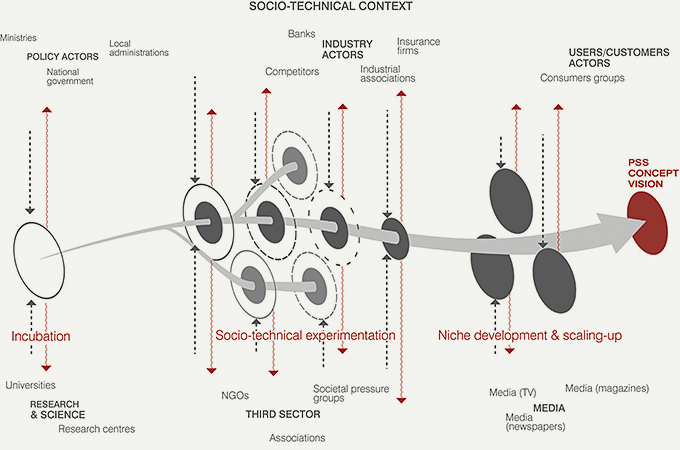 In other words they must learn to design transition paths towards new socio-technical systems. Within these transition paths a crucial role is played by socio-technical experiments. Designers should therefore learn to design these kinds of experiments and in particular to design sequences of experiments capable to act as labs, windows and agents of change. Managing the dynamic adaptation of the societal embedding process. Designers should learn to manage the continuous adaptation and evolution of the project vision, the transition path and the actor network. The societal embedding of an innovation should therefore be managed not as a project with a fixed result, but rather as an open search and learning process. Design, development, experimentation and implementation should be carried out simultaneously and in continuous interaction. Transition towards sustainability requires radical innovations in the way we produce and consume, but their introduction and diffusion usually encounter the opposition of existing habits, organizational structures and regulative frameworks. An important challenge is not only to conceive sustainable innovations, but also to understand the contextual conditions in which they are introduced and explore the most suitable strategies and development pathways to embed these concepts in society. This raises important questions on the role of design in addressing this challenge. And we can observe that this is becoming a more and more relevant issue in the Design for Sustainability community. In this respect researchers have started to explore the role of socio-technical experiments in triggering and supporting socio-technical system changes. In addition to what illustrated in the third section, it is worth mentioning that: Joore (2010) proposed the Multilevel Design Model (MDM) to clarify the mutual relationships between new products, PSSs, socio-technical systems and societal changes; Gaziulusoy (2010) and Gaziulusoy et al. (2013) developed a theoretical and operational framework to link activities or decisions at the product-service development level in organisations with the transformation, which needs to take place at the societal level to achieve sustainability; and Mellick Lopes et al. (2011) have investigated the potential of visual communication design to facilitate social learning in the transition to more sustainable systems. The original contribution made by this paper is the combination of design thinking with concepts and insights from transition studies. Building upon insights from the transition studies field, and through an action research project, the article has explored and delineated the design attitude and skills needed to support socio-technical system changes. A crucial role is given to the implementation of sequences of socio-technical experiments, partially protected spaces (conceived as Labs, Windows and Agents of Change) where broad networks of actors incubate, test, develop and bring the innovation to maturity. If designers want to play a more effective role in the transition towards sustainability they should be aware of the mechanisms and dynamics that regulate the implementation and diffusion of sustainable radical innovations – and how it is possible to guide and orient them. In short, they cannot limit themselves to propose sustainable innovation concepts; rather they should also contribute in influencing shifts in the socio-technical context to favour the implementation and diffusion of such concepts (Ceschin, 2010, 2012, 2014). In this sense designers could guide and support a company, an institution or a network of actors in the process of introducing and gradually embedding sustainable concepts in society. In sum, a new and broader role for design for sustainability emerges. A role focused not only on the innovation itself but also on the socio-technical system in which the innovation is being introduced. In particular a role that sees designers involved not only in conceiving sustainable innovations, but also in: (i) understanding the contextual conditions in which they are being introduced; (ii) identifying the most appropriate implementation strategies (i.e., transition paths, socio-technical experiments) to support the innovation promoters in the introduction and scaling-up process. The main limitation of this study is related to the fact that experts and practitioners involved in assessing the design approach did not apply the approach in practice but evaluated its potential application. This limitation is inherently due to the complexity and the timescale related to apply the approach in a real case: in fact it might take several years to follow the implementation and scaling up of socio-technical experiments (e.g., the Cape Town Sustainable Mobility project was launched in 2009 and it is still running). However, it must be stressed out that this is meant to be an explorative study aimed at generating novel insights. The future step is to start to apply the approach in a set of real cases in order to gain additional and more solid results. In this respect the Cape Town Sustainable mobility project is still running and in future will provide further insights in understanding the role of design in fostering socio-technical changes. In particular the focus will be also oriented to the investigation of the design tools that could be used to support design practice. A relevant research direction is in fact to understand how to combine this new design approach with a proper set of design tools and guidelines to support socio-technical system designers, project managers, and consultants in designing and managing transition processes. 1. Some of the main PSS design methods so far developed are: Kathalys, method for sustainable product-service innovation (Luiten et al. 2001); DES, Design of eco-efficient services methodology (Brezet et al. 2001); PSS innovation scan for industry (Tukker and van Halen 2003); MEPSS, Methodology for Product Service System development (Van Halen et al. 2005); PSS methodology (Morelli 2006); MSDS, Method for System Design for Sustainability (Vezzoli et al. 2009; Vezzoli, 2010). The design research on social innovation has been investigating the role of designer (and related approaches and tools) in: highlighting and give visibility to promising cases; participating peer-to-peer with the other members of the community in the generation of promising cases and in making existing initiatives more effective and accessible; in acting as process facilitator to stimulate participatory approaches between several stakeholders (Meroni, 2007; Jégou & Manzini, 2008). 2. The term was introduced by Ezio Manzini during his keynote speech “To make things happen: Design as a catalyser of community engagement” at the Design Pleasurable Product Interface 2011 conference (Milan, Italy). 3. Among them: (I) the offering diagram, to visualize which customer needs are addressed by the PSS; (II) the interaction table, to visualize how the PSS providers deliver the service and how the customers are to be satisfied; (III) the system map, to visualize the structure of the value chain; (IV) the sustainability diagram, to visualize the environmental, socio-ethical and economic benefits. Ballon, P., Pierson, J., & Delaere, S. (2005). Open innovation platforms for broadband services: Benchmarking European practices. In Proceedings of the 16th European Regional Conference. Porto, Portugal: Universidade Católica Portuguesa. Binswanger, M. (2001). Technological progress and sustainable development: What about the rebound effect? Ecological Economics, 36(1), 119-132. Bolund, P., Johansson, J., & Steen, P. (1998). Factor 10, economic growth and welfare. Stockholm, Sweden: FMS. Borja de Mozota, B. (1990). Design & management. Paris, France: Les Editions d’Organisation. Brookes, L. (2000). Energy efficiency fallacies revisited. Energy Policy, 28(6/7), 355-366. Brown, H. S., Vergragt, P. J., Green, K., & Berchicci, L. (2003). Learning for sustainability transition through bounded socio-technical experiments in personal mobility. Technology Analysis & Strategic Management, 13(3), 298-315. Burns, C., Cottam, H., Vanstone, C., & Winhall, J. (2006). RED paper 02: Transformation design. London, UK: Design Council. Crabtree, B., & Miller, W., (Ed.) (1999). Doing qualitative research (2nd ed.). Newbury Park, CA: Sage. Cantú, D. (2012). Ideas sharing lab. Community centred design for multifunctional and collaborative food services (Unpublished doctoral dissertation). Politecnico di Milano, Milan, Italy. Ceschin, F. (2010). How to facilitate the implementation and diffusion of sustainable Product-Service Systems? Looking for synergies between strategic design and innovation sciences. In Proceedings of the Conference on Sustainability in Design: Now! (pp. 440-454). Sheffield, UK: Greenleaf Publishing. Ceschin, F. (2012). The introduction and scaling up of sustainable product-service systems. A new role for strategic design for sustainability (Unpublished doctoral dissertation). Politecnico di Milano, Milan, Italy. Ceschin, F. (2013). Critical factors for managing the implementation and diffusion of eco-efficient product-service systems: Insights from innovation sciences and companies’ experiences. Journal of Cleaner Production 45, 74-88. Ceschin, F. (2014). Sustainable product-service systems: Between strategic design and transition studies. London, UK: Springer. Gaziulusoy, A.I. (2010). System innovation for sustainability: a scenario method and a workshop process for product development teams. (unpublished doctoral dissertation). The University of Auckland, Auckland, New Zeland. Gaziulusoy, A.I., Boyle, C., & McDowall, R. (2013). System innovation for sustainability: a systemic double-flow scenario method for companies. Journal of Cleaner Production, 45, 104-116. Geels, F. W. (2002). Technological transitions as evolutionary reconfiguration processes: A multilevel perspective and a case-study. Research Policy, 31(8/9), 1257-1274. Geels, F. W. (2005). Processes and patterns in transitions and system innovations; Refining the co-evolutionary multi-level perspective. Technological Forecasting and Social Change 72(6), 681-96. Geels, F. W., & Raven, R. P. J. M. (2006). Non-linearity and expectations in niche-development trajectories: Ups and downs in Dutch biogas development (1973-2003). Technology Analysis & Strategic Management 18(3-4), 375-392. Goedkoop, M. J., van Halen, C. J. G., te Riele, H. R. M., & Rommes, P. J. M. (1999). Product service systems, ecological and economic basics. The Hague, The Netherlands: VROM. Gumus, H. (2009). Kanga: A sustainable system design for the transportation of learners with disabilities in Cape Town – South Africa (Master’s degree thesis). Politecnico di Milano, Milano, Italy. Hegger, D. L. T., van Vliet, J., & van Vliet, B. J. M. (2007). Niche management and its contribution to regime change: The case of innovation in sanitation. Technology Analysis & Strategic Management 19(6), 729-746. Heiskanen, E., & Jalas, M. (2000). Dematerialisation through services: A review and evaluation of the debate. Helsinki, Finland: Ministry of the Environment, Environmental Protection Department. Hillgren, P. A., Seravalli, A., & Emilson, A. (2011). Prototyping and infrastructuring in design of social innovation. CoDesign, 7(3-4), 169-183. Hoogma, R. (2000). Exploiting technological niches: Strategies for experimental introduction of electric vehicles (Ph.D. Thesis). Enschede, The Netherlands: Twente University Press. Hoogma, R., Kemp, R., Schot, J., & Truffer, B. (2002). Experimenting for sustainable transport: The approach of strategic niche management. London, UK: Spon Press. Jégou, F. (2011). Social innovations and regional acupuncture towards sustainability. Chinese Journal of Design, 214, 56-61. Jégou, F., & Manzini, E. (Eds.) (2008). Collaborative services. Social innovation and design for sustainability. Milan, Italy: Edizioni Polidesign. Joore, P. (2010). New to improve: The mutual influence between new products and societal change processes. Doctoral dissertation. Delft University of Technology. Kemmis, S., & McTaggart, R. (1988). The action research planner. Geelong, Australia: Deakin University Press. Kemp, R., Schot, J., & Hoogma, R. (1998). Regime Shifts to Sustainability Through processes of niche formation: The approach of strategic niche management. Technology Analysis & Strategic Management, 10(2), 175-195. Manzini, E. (1999, July 13). Sustainable solutions 2020 - Systems. Paper presented at the 4th international conference towards sustainable product design, The Centre for Sustainable Design, Brussels, Belgium. Manzini, E. (2008). Collaborative organisations and enabling solutions. Social innovation and design for sustainability. In F. Jegou & E. Manzini (Ed. ), Collaborative services. Social innovation and design for sustainability (pp. 29-41). Milano, Italy: Edizioni Polidesign. Manzini, E., & Rizzo, F. (2011). Small projects/large changes: Participatory design as an open participated process. CoDesign, 7(3-4), 169-183. Manzini, E., & Vezzoli, C. (2003). A strategic design approach to develop sustainable product service systems: Examples taken from the ‘environmentally friendly innovation’ Italian prize. Journal of Cleaner Production, 11(8), 851-857. Mellick Lopes, A., Fam, D., & Williams, J. (2011). Designing sustainable sanitation: involving design in innovative, transdisciplinary research. Design Studies, 33, 298-317. Meroni, A. (Ed.) (2007). Creative communities. People inventing sustainable ways of living. Milan, Italy: Edizioni Polidesign. Meroni, A. (2008a). Strategic design: Where are we now? Reflection around the foundations of a recent discipline. Strategic Design Research Journal, 1(1), 31-38. Meroni, A. (2008b, October 9). Strategic design to take care of the territory. Networking creative communities to link people and places in a scenario of sustainable development. Keynote presented at the conference “8º Congresso Brasileiro de Pesquisa e Desenvolvimento em Design”, Campus Santo Amaro, San Paolo, Brazil. Mont, O. (2002). Clarifying the concept of product-service system. Journal of Cleaner Production, 10(3), 237-245. Morse, J. (1995). The significance of saturation. Qual Health Research, 5(2), 147-149. Patton, M. Q. (2002). Qualitative research and evaluation methods (3rd ed). Thousand Oaks, CA: Sage. Raven, R. P. J. M. (2005). Strategic niche management for biomass. (Doctoral dissertation). Eindhoven, The Netherlands: Technische Universiteit Eindhoven. Raven, R. P. J. M., van den Bosch, S., & Waterings, R. (2010). Transition and strategic niche management: Towards a competence kit for practitioners. International Journal of Technology Management, 51(1), 57-74. Reason, P. E., & Bradbury, H. (Eds.) (2001). Handbook of action research: Participative inquiry and practice. London, UK: Sage. Rip, A., & Kemp, R. (1998). Technological change. In S. Rayner & E. L. Malone (Eds.) Human choice and climate change (Vol. 2, pp. 327-399). Columbus, OH: Batelle Press. Rockström, J., Steffen, W., Noone, K., Persson, Å., Chapin, F. S., Lambin, E. F., ... & Foley, J. A. (2009). A safe operating space for humanity. Nature, 461, 472-475. Rotmans, J., Kemp, R., van Asselt, M., Geels, F. W., Verbong, G., & Molendijk, K. (2000). Transities & transitiemanagement: De casus van een emissiearme energievoorziening [Transitions & transition management: The casus of a low emission energy supply]. Maastricht, The Netherlands: Maastricht University. Rotmans, J., & Loorbach, D. (2010). Towards a better understanding of transitions and their governance: A systemic and reflexive approach. In J. Grin, J. Rotmans, & J. Schot (Eds.) Transitions to sustainable development. New directions in the study of long term transformative change (pp. 105-220). London, UK: Routledge. Sangiorgi, D. (2010). Transformative services and transformation design. International Journal of Design, 5(1), 29-40. Schmidt-Bleek, F. (1996). MIPS book or the fossil makers - Factor 10 and more. Boston, MA: Birkhäuser Verlag. Schot, J. A., & Hoogma, R. (1996). De invoering van duurzame tTechnologies: Strategisch Niche Management als beleidsinstrument [The introduction of sustainable technologies: Strategic Niche Management as a policy management tool]. Delft, The Netherlands: Delft University of Technology. Simeone, G. & Cantú, D. (2011). Feeding Milan. Energies for change. A framework project for sustainable regional development based on for de-mediation and multifunctionality as design strategies. In Lou, Y. & Zhu, Z. (Eds. ), Proceedings of Cumulus Shanghai Conference: Young Creators for Better City and Better Life (pp. 458-464). Helsinki, Finland: Aalto University. Simons, L., Slob, A., Holswilder, H., & Tukker, A. (2001). The fourth generation: New strategies call for new eco-indicators. Environmental Quality Management, 11(2), 51-61. Stahel, W.R. (2000). From Manufacturing Industry to a Service Economy, from Selling Products to Selling the Performance of Products. Geneva: Product-Life Institute. Stålbröst, A. (2008). Forming future IT: The living lab way of user involvement. (Doctoral dissertation). Luleå, Swedish: Luleå University of Technology. Strauss, A., & Corbin, J. (1998). Basics of qualitative research: Techniques and procedures for developing grounded theory. Newbury Park, CA: Sage. Tukker, A., & Tischner, U. (2006) Product-services as a research field: Past, present and future: Reflections from a decade of research. Journal of Cleaner Production, 14(17), 1552-1556. United Nations Environmental Programme (UNEP). (2002). Product-service systems and sustainability: Opportunities for sustainable solutions. Paris, France: UNEP, Division of Technology Industry and Economics, Production and Consumption Branch. Van de Poel, I. (2000). On the role of outsiders in technical development. Technology Analysis and Strategic Management 12(3), 383-397. Van den Bosch, S. (2010) Transition experiments. Exploring societal changes towards sustainability. (Doctoral dissertation). Erasmus Universiteit Rotterdam, Rotterdam, The Netherlands. Van der Laak, W. W. M., Raven, R. P. J. M., & Verbong, G. P. J. (2007). Strategic niche management for biofuels: Analysing past experiments for developing new biofuel policies. Energy Policy, 35(6), 3213-3225. Verheul, H., & Vergragt, P. J. (1995). Social experiments in the development of environmental technology: A bottom-up perspective. Technology Analysis & Strategic Management, 7(3), 315-326. Vezzoli, C. (2007). System design for sustainability. Theory, methods and tools for a sustainable “satisfaction-system” design. Rimini, Italy: Maggioli Editore. Vezzoli, C., Ceschin, F., & Cortesi, S. (2009). Metodi e strumenti per il Life Cycle Design. come progettare prodotti a basso impatto ambientale [Methods and tools for Life Cycle Design: how to design low environmental impact products]. Rimini, Italy: Maggioli Editore. Vezzoli. C., Ceschin, F., & Kemp, R. (2008). 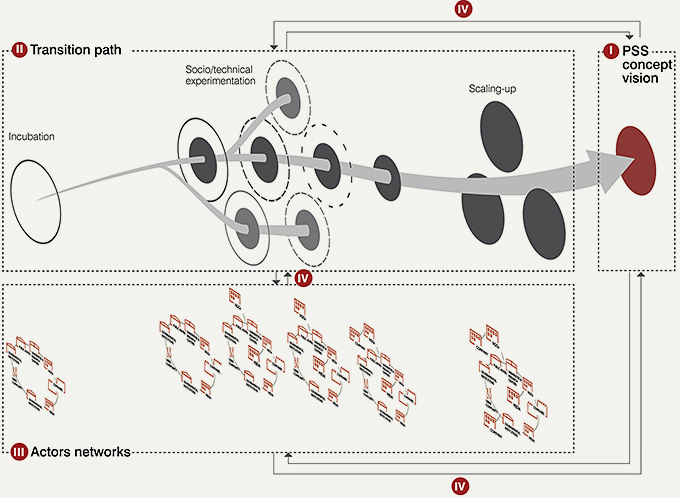 Designing transition paths for the diffusion of sustainable system innovations. A new potential role for design in transition management? In Proceedings of the Conference on Changing the Change (pp. 440-454). Turin, Italy: Umberto Allemandi. Weber, M., Hoogma, R., Lane, B., & Schot, J. (1999). Experimenting with sustainable transport innovations: A workbook for strategic niche management. Enschede, The Netherlands: Universiteit Twente. White, A. L., Stoughton, M., & Feng, L. (1999). Servicizing: The quiet transition to extended product responsibility. Boston, MA: Tellus Institute. Zurlo, F. (1999). Un modello di lettura per il design strategico. La relazione tra design e strategia nell’impresa contemporanea. [An interpretation model for strategic design. The relationship between design and strategy in contemporary firm] (Doctoral dissertation). Milan, Italy: Politecnico di Milano.